When I first started blogging back in 2009, there was a lot I didn’t know. I had more questions than answers and more confusion than clarity. When it came to monetizing a blog, I only knew of three ways to make a profit, and two of them required me to trade my time for dollars. I really needed a simple blog business plan that would provide me focus, clarity, and direction. Since I couldn’t find one, I decided to create one. Over the years, I have tweaked and adjusted this simple blog business plan to make it even better. I’ve tested it with other bloggers that I’ve mentored, and it’s become a very useful tool. If you feel scattered and lack clarity, you need to download this simple one-page blog business plan. If you feel scattered and lack clarity, you need to download this simple blog business plan. 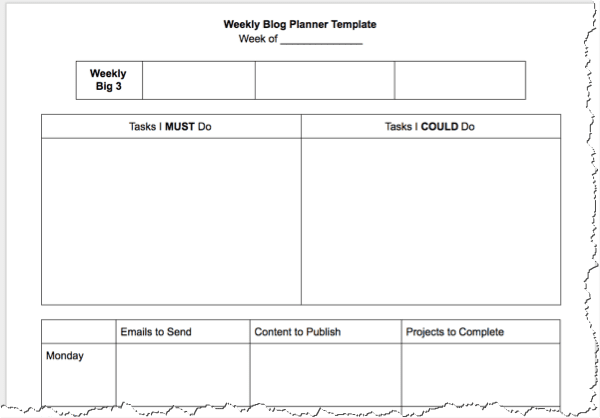 Want a printable version of the One Page Blog Business Plan? Click Here to download this handy one-page PDF. This blog business model tool is ideal for both beginner and experienced bloggers. It will establish the few essentials needed to grow your blog into a full-time income. It will also give you permission to stop doing the things you think are important, but in reality, are not. Section 1: Who do you want to help? If you are unsure of who your target audience might be, then you should check out our post on how to nail down your target audience. In the post, I talk about the importance of identifying your audience’s GPS. This is a simple acronym that stands for goals, passions, and struggles. Intimately knowing your audience’s goals, passions and struggles are the keys that will unlock your success. To be successful at filling out the rest of your blog business plan, you’ll need to record these at the top of the page. Knowing your audience’s goals, passions and struggles are the keys that will unlock your success. Section 2: Where are they already hanging out? If you launch your blog, they will come. This is the mentality of many new bloggers. They become quickly discouraged when the floods of internet traffic don’t come knocking on their door. The best way to get blog traffic fast is to get in the direct pathway of where your ideal audience is already hanging out. The best way to get blog traffic fast is to know where your ideal audience is already hanging out. Section 3: How do we attract them? Discovering where they are already hanging out is only one piece of the puzzle. Now you have to figure out how to get them to come check out what you have to offer without being pushy, salesy, or sleezy. One of the best ways to do this is to give. Figure out who to offer them something of value in exchange for an email address. I do this with a tool called ConvertKit and it is fantastic. Before you jump in and start asking people to come to your site, be known for giving great advice first. I’ve used this strategy to launch three unique online brands. Accounting & Finance Career Coaching – The purpose of my first blog was to help accounting & finance career professionals. I found an online forum where my target audience was asking for career advice. Each night, I would answer 5-10 questions, while each time leaving a digital footprint. Most forums allow you to have a signature with your name and website. Online Blog & Business Coaching – Almost a year before I launched Blogging Your Passion, I started a group in 48Days.net by the same name. I served this community first before I launched the blog and the business. Personal Development & Life Coaching – Just over two years ago, I decided to rebrand my original career coaching blog into a personal brand. In order to make the transition, I joined a membership site that included my ideal audience and served them by offering help and advice. Pro Tip: To speed up your results, create at least three lead magnets that can be used to attract your ideal audience. When I first started my career coaching blog, I created the Ultimate LinkedIn Guide for Accounting Professionals. This allowed me to be generous while building my email list at the same time. In this section, list three possible lead magnets you could create as free giveaways. Section 4: What result are they after? Here’s where the money equation comes into play. At the end of the day, your audience is not after information, they are after transformation. The good news for you is that there are several ways you can earn money as a blogger. At the end of the day, your audience is not after information, they are after transformation. Writing income streams – Examples in this category would include Kindle books, paperback books, audiobooks, and more. Speaking income streams – You can get paid to speak via keynotes, workshops, paid webinar training, and open enrollment workshops. Coaching income streams – For online communicators I would include online courses, membership sites, one on one coaching and group coaching. As you can see, there are multiple ways to monetize any message. While this one-page blog business plan is designed to be simple, the execution is not easy. You don’t create seven to ten income streams overnight. However, over time you can monetize your message using multiple income streams. My advice is to select one potential income stream and make a 90-day game plan to execute on that strategy.